In recent years, more and more travelers are being accompanied by emotional “support” animals in the passenger hold to help with, presumably, flight anxiety. While there is no doubt many people are in need of service or support animals, there should also be no doubt the system is being abused. And we are not just talking about eccentric ladies with teacup poodles and cats. Snakes, spiders, possums…a diaper-wearing ferret; all have been presented by passengers as a medical necessity to flying. 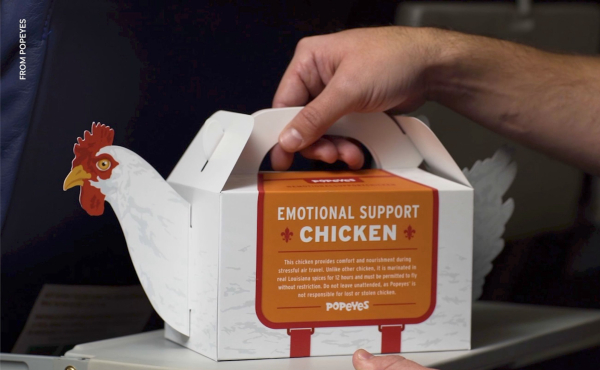 Let us not forget comfort birds either. Parrots, turkeys; an emotional support peacock all flew, so to speak, to address the emotional needs of their owners. Chickens as well, which is where People for the Ethical Treatment of Animals (PETA) gets involved. It takes a great deal of hutzpah for PETA to make such a statement, especially when one considers the source. You may recall this is the animal rights organization that trivialized the Holocaust, blamed mental illness on consumption of meat, exploited naked women for advertising purposes, including PETA founder Ingrid Newkirk, and compared champion dogs to Hitler. 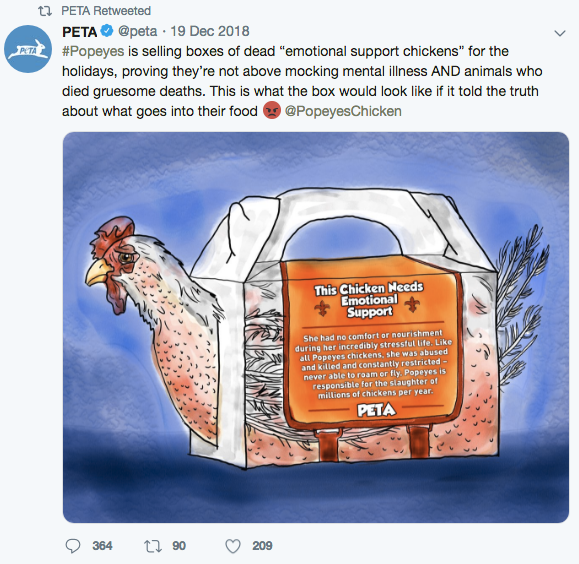 This is also the organization that to this day kills hundreds of dogs and cats annually at its pet “shelters.” PETA is hardly in a position to take the moral high ground on this trumped up “issue” of fried chicken, but feigning righteous indignation when it is convenient has never ben an issue for this publicity-hungry group. Speaking of which, and considering I fly out in the morning, I am thinking about killing two birds with one stone. Anyone up for fried chicken tonight? -Steve Scott is a reformed attorney, TV host and producer, ice cream aficionado, and editor of The Outfitter Wire.